Step 1. Stalk us. There are a few key factors to consider when seeking a qualified motorcoach operator for your charter. 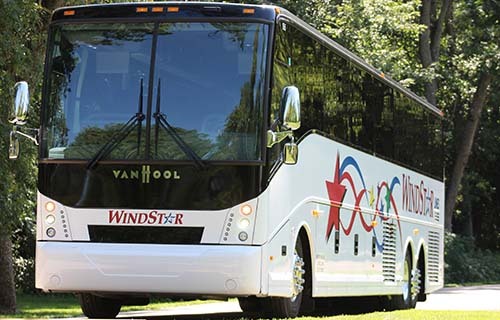 As the first step in the motorcoach rental process, do your research and look for things such as their safety record, company values, as well as how long they’ve been in business, and the size, variety, and age of their fleet. Step 2. Get your ducks in a row. There are several variables that factor into arriving at your quote. We will need as many details about your trip as you can give us, most importantly, dates, times, departure location, and destination. Having this information available from the beginning will provide you with an accurate quote the first time around. Step 3. Make contact. Once you’ve decided that Windstar Lines is a company you feel good about and you have gathered your pertinent information, call our toll free number, 888-494-6378, and ask for a Charter Sales Agent. If you’re not quite ready to talk to us, feel free to complete our handy Online Quote form. It’s quick and easy to use! Step 4. Don’t bite your fingernails! Once your Charter Sales Agent has your information, he/she will begin their work producing a fair quote for your trip. We strive to have all of our quotes fulfilled and back to you within two hours, but there are instances every once in a while, that take a bit more time. Step 5. Get that ball rolling! Thank you for choosing Windstar Lines! The next step is to contact your Charter Sales Agent to accept our quote. You can call us at 888-494-6378, or if you’re still not up to talking to us, feel free to use our email addresses. Prior to sending you a contract, your agent will need a few more details, including your business name (if applicable), address, and phone number. Be sure to have those “ducks” in a row again! Step 6. Sign here, please. You will be sent a contract for your review. Please sign and return it to our office, along with the required deposit. Final payment, as well as a detailed itinerary is required 21 days prior to your departure date. Step 7. Celebrate. Go ahead. Jump around, wave your arms, pat yourself on the back or smile a great big cheesy grin! You did it! You have successfully chartered your motorcoach. Now, leave the rest up to us!